If the suggested path of obtaining the tree samples is too complicated â go to a saw mill and ask them to cut tree disks or cut some of your own from a tree trunk. Educators should assign the extension on solutions to the students at the end of the lesson. If a coring borer is used - measure the diameter of the tree to determine how deep to core the tree. Obtaining local weather records for seasonal average rainfall and temperatures would provide a basis of comparing the influence of these factors on tree growth. Additional resource to consult: Esper, J., E. R. Cook, and F. H. Schweingruber (2002) Low-frequency signals in long tree-ring chronologies for reconstructing past temperature variability. Science 295:2250-2253 and http://www.cru.uea.ac.uk/cru/people/briffa/yamal2009/. There are also paper versions of tree-ring/dendrochronology activities that could be linked to this since, indeed, obtaining core or cross section may be hard for some. Not all trees can necessarily be used for coring. Great hands-on activity that demonstrates the scientific processes of dendrochronology. Carefully designed activity with a lot of background materials for educators and students (at different levels). 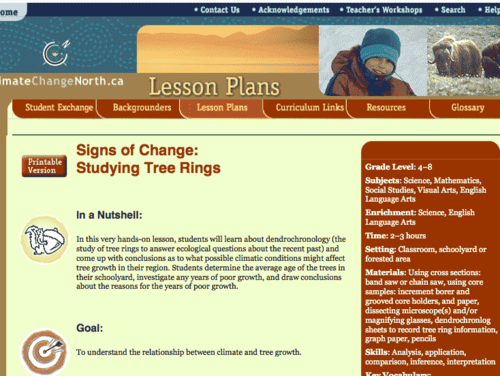 Strong connections to regional climate through local examples of trees will engage students and demonstrate the relevance of the method. Ideally educator would also show what a published dendrochronology diagram looks like (easy to find through a literature search). Hands-on activity and interpretation of results will engage students of different learning styles. Activity offers enrichment ideas that focus on the development of language arts and science process skills. The extensions present solutions to climate change, a great way to empower students when teaching about climate change. Effective strategies to assess student understanding are suggested. Very well designed and ready to use. It would be ideal to have a least one microscope for the students to work with.